Honor today debuted two phones – The Honor 9i (2018) and the Honor Play. However, these two aren’t the only new piece of tech that the Huawei sub-brand has launched today. The company also launched the ‘GPU Turbo’ technology which according to company’s claims will make use of optimisations on the software and hardware to deliver improved quality graphics along with saving a lot on power. Honor said that it is due to this technology that the smartphones will be able to increase the graphics processing efficiency by up to 60% and reduces the power consumption by 30%. Out of the two phones launched, the Honor Play is going to feature the GPU Turbo technology. The Honor Play is going to be the first phone to come with GPU Turbo technology. The main highlight of the GPU Turbo is going to be the HDR like rendering, which owing to the upgrades on the phone, will be able to render HDR quality graphics even in non-HDR games. To give you sneak peek on the Honor Play, the smartphone sports a 6.3-inch display with Full HD+ (1080 x 2280 pixels) resolution and 19:9 aspect ratio. The device also comes with a notch. Owing to this new design, the screen-to-body ratio on the phone is 89%. The main processing power is delivered in the phone by the in-house manufactured Kirin 970 octa-core processor coupled with a dedicated NPU and 4GB/6GB of RAM depending on the variant. The device comes with 64GB of internal storage space which is expandable using microSD card. The device remains gaming focused as it provides 7.1-channel Histen sound and 3D game sound effects which have been touted to provide quality audio-visual experience. The operating system on the phone is the new EMUI 8.2 built on top of Android 8.1 Oreo. The power source on the device is 3750mAh non-removable battery, which according to the claims, lasts for a day. Speaking of the camera, the Honor Play features a dual rear camera setup of 16MP + 2MP dual AI cameras which feature faster dual-core autofocus and auto scene detection. On the front, there is a 16MP front-facing camera with 3D studio lighting and portrait mode support, for selfies. The colour variants on this device are Black, Blue & Violet which come with a metal unibody design. 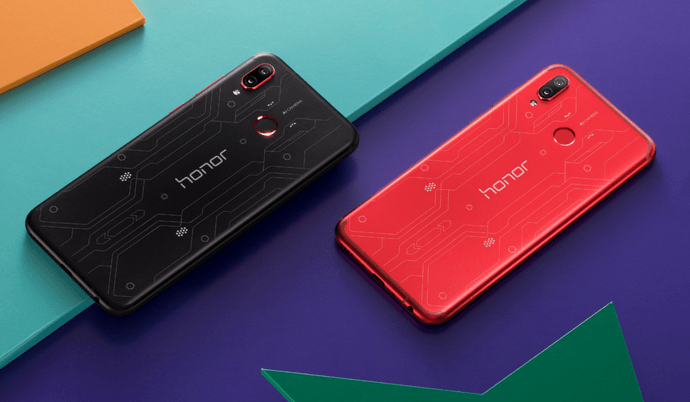 Black and Red colour special edition devices have also been rolled out by Honor, with patterned designs on the rear. The Honor Play 4GB variant and 6GB RAM variant will retail for 1999 Yuan and 2399 Yuan respectively. The special edition phone which comes with 6GB RAM remains highly priced at 2499 Yuan. The device’s pre-orders start today, and the sale of the phone goes live on June 11 in China.